The State Director is the chief elected officer of the State Council and effectively establishes policy, strategies, and objectives consistent with SHRM, Region and National Board policies. The State Director provides guidance to Council members. State Council and North Central Region Director. Manage the affairs of the Council as the chief elected officer. Sit as a voting member on the North Central Region Board. Preside over meetings of the Council. As appropriate, conduct general membership meetings involving SHRM members within the State. Act as an ex-officio member of all State committees. Provide leadership for the Council by assigning responsibilities for achieving State, Region, and national objectives. Direct the activities, plans, and objectives of all Council members. Promote the Council and the profession by personal appearances and speaking engagements before SHRM chapters and other organizations. Prepare regular reports for the Region Board and/or National Board as required. Identify individuals who demonstrate effective leadership roles within the district for potential leadership involvement on the council. Provides direction, assistance and support of professional development activities within the state and SHRM. SHRM membership in good standing required. Current year Council membership required. Serves a one-year term beginning with the first day of January ending the last day of December. May be re-elected for one additional term for a total of two years. 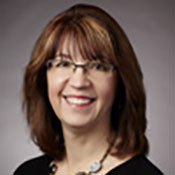 Joanne Krueger, SHRM-CP, PHR is the Senior Talent Acquisition Consultant at the Medical College of Wisconsin a distinguished leader and innovator in the education and development of the next generation of physicians, scientists, pharmacists and health professionals. In her role she has primary responsibility for providing human resources support and guidance for the organization, including candidate sourcing, recruitment, and training. Joanne has over 20 years of human resources experience in the healthcare and consumer products industries. Before joining the Medical College of Wisconsin, Joanne enjoyed 11 years at Planned Parenthood of WI and 14 years with MillerCoors, formerly Miller Brewing Company. Joanne is an active member of the Society for Human Resources Management (SHRM) since 1997, and currently serves as State Director. Previously she served as WI State Council SHRM District Director-Southeast and President of Metro Milwaukee SHRM from 2008-2010. Joanne earned her Bachelors of Science in Business Management degree from Cardinal Stritch University.